A reduction in labour cost, improved communication between store teams and more efficient store operations, these are just some of the benefits Papa John’s UK are seeing since they began using Quinyx. This is what delegates from around the country heard at the UK’s first Quinyx ‘Power Breakfast’ which took place in the centre of London on Wednesday, February 22nd. Alongside the Papa John’s story, those in attendance were also treated to an insightful panel discussion and a further talk exploring the development and importance of better workforce management from Quinyx Founder and CEO, Erik Fjellborg. It was this talk that set the context for how Papa John’s are using Quinyx to revolutionise their workforce management. With last year’s twin impacts in the UK of Brexit and the implementation of the National Living Wage, there’s increasing uncertainty surrounding the economy and a potential shortage of labour on the horizon. This labour shortage, combined with a 5% increase in the National Living Wage due in 2017, means it’s essential for businesses to have better control over their workforce, their costs and their KPIs. And, as Erik Fjellborg explained, failure to schedule well, by even a few percentage points, can destroy an organisation’s profit margins. 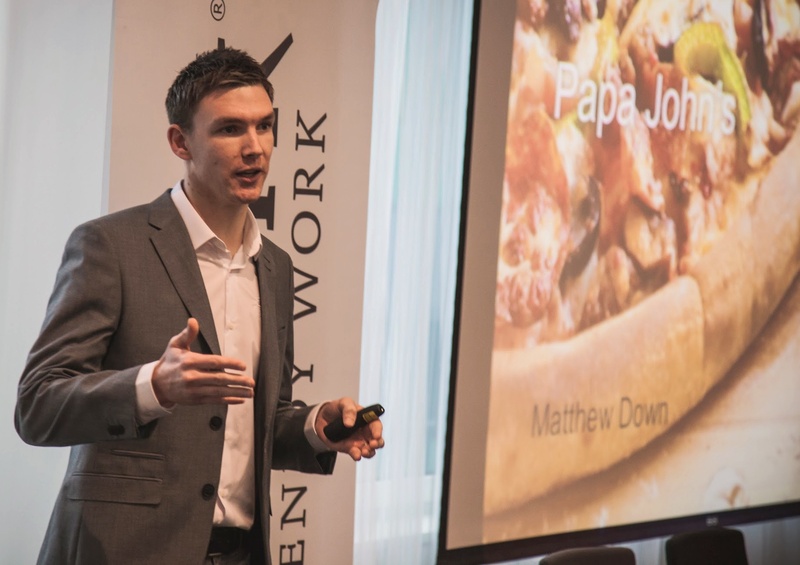 And, as Matthew Down, Operations support and training manager at Papa John’s UK, went on to add, it was these needs which brought Papa John’s to Quinyx. The pizza company, founded in the USA back in 1984, opened its first UK store in 2001 and now run more than 350 around the country. This rapid growth, a desire to always deliver a top quality service and the need to engage with their employees were the catalyst for Papa John’s to find a workforce management solution that fits their business. With their ethos that makes people and quality the top priority, there was a natural synergy with Quinyx. These challenges were ultimately capping Papa John’s growth, which brought them to the position of needing a workforce management solution. In the summer of 2016 they ran an 8 week trial of Quinyx across three different stores and the impact was immediate. To add to this, Matthew Down said: “There were two key reasons why we chose Quinyx over the other provider we were also running a trial with. The first one was the adoption of the system. In the three stores that had Quinyx there was a higher rate of usage, and, not just using the system, but actually using it correctly. Quinyx is currently being rolled out across the Papa John’s stores in the Uk with discussion under way of increasing this throughout Europe. If you’d like to find out more about how Quinyx can help your business be more efficient, reduce labour costs and provide a better service, one of our team would love to talk to you.